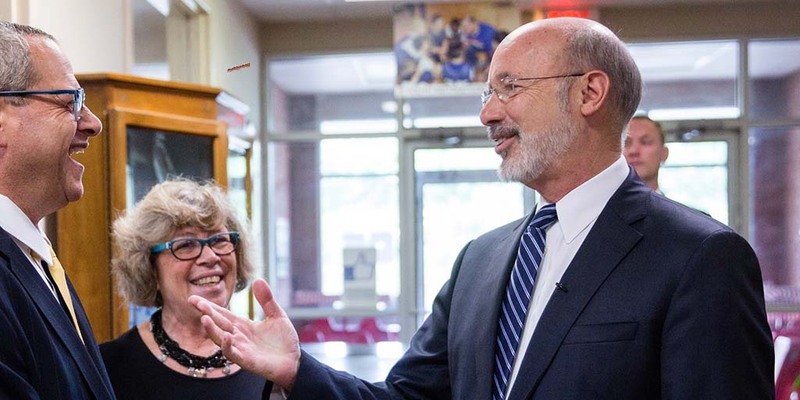 Erie, PA – Today, Governor Tom Wolf announced new funding to support five projects in Erie County, including improvements to sports complexes, the construction of a new rural health facility, and renovations to a hotel and a senior living center. Erie County Convention Center Authority was approved for a $12 million, multi-year grant for improvements to UPMC Park that will include a new structure to house the ticket offices, administrative offices, storage, and team stores for the baseball and hockey teams, plus renovations to existing ballpark structures, and streetscaping. The award is for $3 million per year for four years. Erie County General Authority was approved for a $1 million grant for renovation of the Avalon Hotel into an upscale Hilton Doubletree hotel. Renovation of the hotel aligns with the Emerge 2040, Erie Refocused, and Erie Downtown Master comprehensive plans and provides upscale hotel service to downtown Erie and overflow for the convention center. Presbyterian Homes in the Presbytery of Lake Erie was approved for a $500,000 grant for the renovation of Elmwood Gardens, a single-story community that provides seniors with independent living, personal care and skilled nursing, and short-term rehabilitation. Upgrades include a new roof, renovations and expansion of nursing stations, new flooring in resident rooms, HVAC improvements, window upgrades, dining room expansion, and elevator upgrades. The Redevelopment Authority in the City of Corry was approved for a $1 million grant for the construction of a new Medical Arts facility connected to the Corry Memorial Hospital. The 10,500-square-foot facility will provide space for specialty doctors rotating in on a weekly basis from LECOM’s hospital in Erie. In addition, a 44,000-square-foot, 24-unit senior living center will be constructed adjacent and connected to the Medical Arts facility. This project is especially important for public health in the Corry area, as patients currently must drive an hour to receive care from specialists. This project will bring the doctors to the patients, providing a vital boost to public health and community development in Corry. Previously announced in July, the City of Erie was approved for a $2 million grant to support the renovation of JMC Ice Arena. Operated by the Erie Zoological Society, this project includes the renovation of the existing building and systems in order to make JMC Ice Arena operable again. Funding will support a new ice making system and new interior work, including a new ceiling, a new front entrance, and cosmetic work to locker rooms and the lobby, and new bleachers for guests. From 2015 through July of this year, the commonwealth helped to secure more than $80 million in various transportation, business development, and community revitalization projects throughout the Erie region. Last year, the Wolf administration partnered with Disabled Veteran Solutions, a veteran-owned business that focuses on hiring veterans and military families to expand operations at a new site in Erie and create more than 200 new jobs. The administration also made significant commitments at the Bayfront, including a plan to connect downtown Erie to the waterfront to bring visitors from the Bayfront to the downtown area where they can visit local businesses and downtown restaurants.